In 2015, First Nations Development Institute (First Nations) awarded 15 grants totaling $523,000 under the Seeds of Native Health campaign. Seeds of Native Health was created and funded by the Shakopee Mdewakanton Sioux Community (SMSC), and is a major philanthropic effort to improve the nutrition of Native Americans across the country. First Nations was one of SMSC’s inaugural strategic partners in the effort. 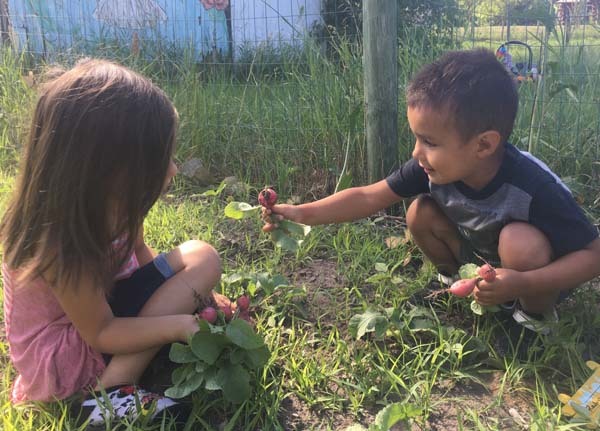 Through First Nations, the Leech Lake Band of Ojibwe, Cass Lake, Minnesota, was awarded $33,743 for its project that focused on the creation of a community garden at the tribal school, with the aim of highlighting healthy and local meal choices. The Naajimijime Project garden at Leech Lake Early Childhood Headstart was started with the Seeds of Native Health funding. The tribe purchased and developed a greenhouse and garden beds for students and community members to cultivate traditional crops, and conduct classroom lessons, workshops, trainings and other activities aimed at developing a holistic approach to wellness. The following article and photos originally appeared in the Leech Lake SNAP-ED’s This Month in the Garden, August 2017 newsletter, and are reprinted here with permission. We have continued the harvest of peas, green and black beans, broccoli, cauliflower, tomatoes, cayenne peppers, bell peppers, onions, cucumbers, zucchini, yellow (summer) squash, kale, lettuce, kohlrabi and our herbs. At the beginning of August, we were also able to help create an opportunity for the youth to see a local farm that produces food for the locals of Solway. We are very excited to watch our melons and winter squash grow while our early childhood kids have had the last part of August off. We are also very excited to show them the corn and eggplants that are growing! We will start fall classes with them when school starts up again on September 6th! The Boys & Girls Club gardens have been maintained wonderfully by their devoted youth. They have been producing a lot of yellow (summer) squash which we were able to use in a cooking demonstration of a Three Sister’s Succotash, which all the kids really ended up enjoying and even more so that they were able to take something from their garden and create something delicious. When the youth return for the school year (Sept. 6th) they will be able to finally pick some of their melons that have continued to grow in their absence. The Cass Lake Community Gardens that were planted with the help of University of Minnesota extension coordinator, the Cass Lake-Bena Elementary School Summer Program and the Boys & Girls Club, produced a lot of radishes! Youth were able to go and pick the radishes that made it through all the grass! The garden also produced several pear tomatoes and onions! Their squash also looked to be doing very well. However, the carrots and beets did not make it and the Brussels sprouts looked to be struggling. Remember to go down and check it out, pull some weeds, take home some onions!